I “Lewinii (Hennings) blaßgelb Blüten” Keep this image in mind. We are going to refer to it again later. 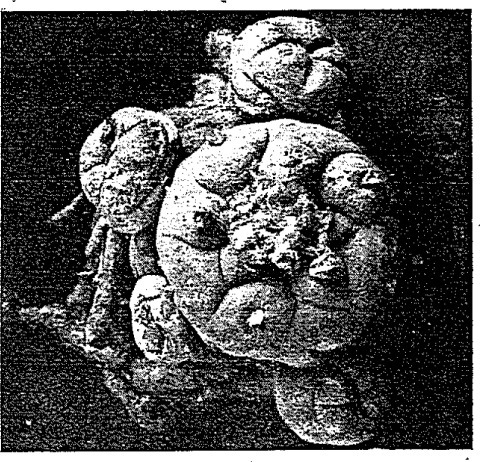 In Frič’s earlier use of this image, in 1924, he labelled this sp. lutea Frič. Frič should have kept it as sp. lutea. III “Williamsii (Lem.) 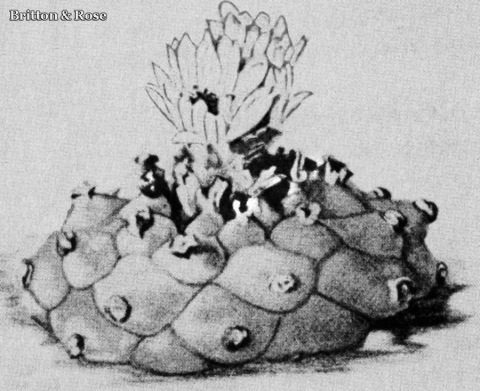 blaßrosa Blüten” In its first appearance, in Frič 1924, this was Anhalonium sp. fl. rosea Frič. 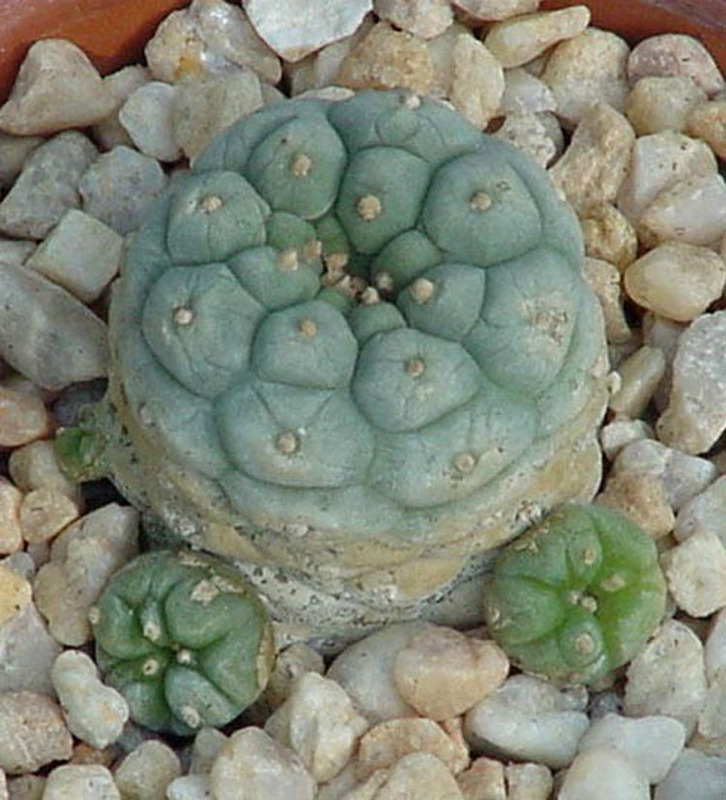 (This became Lophophora williamsii var. decipiens in Backeberg 1961.) Fric’s account enabled Denis Cowper to locate it; it is now Lophophora fricii. V “Jourdaniana (syn. violaciflora) violetrosa Blüten.” In 1924, Frič had this image labelled as “Lewinii“. Many Lophophora species names have appeared in print. Most of those are horticultural or sometimes they are erroneous. In earlier editions of this book, the problem names that were discussed were lumped together into one confusing section. In the present arrangement they are being treated separately in alphabetical order. Many other ‘species’ and varieties have been proposed due to peyote’s highly variable nature. There seems little point in discussing them all. 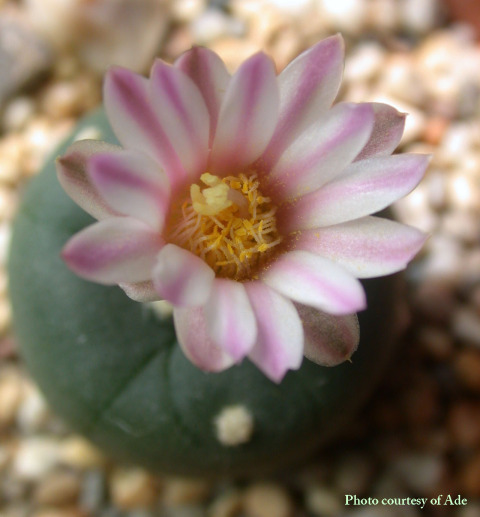 They are simply forms and many of them can be found within any large single population of peyote. Anderson and Grym have summarized them, and why they should be rejected, very nicely. 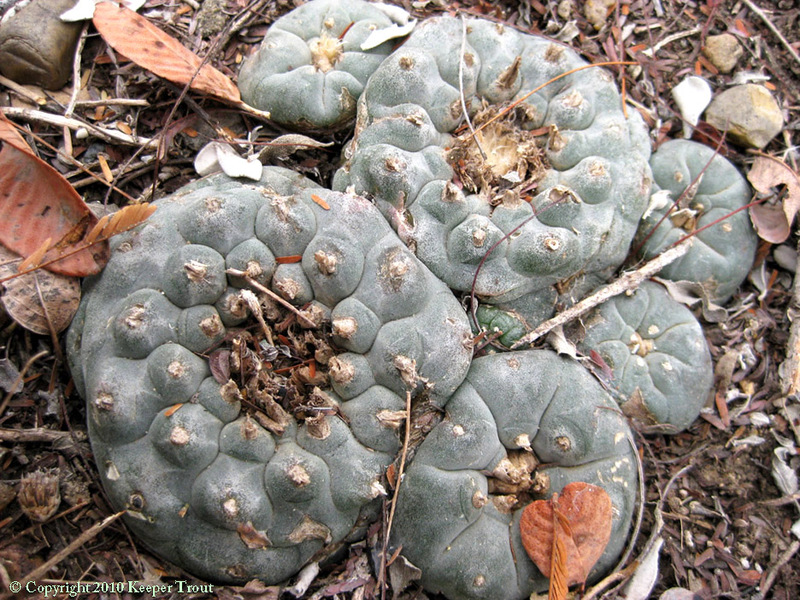 For instance please compare the L. williamsii pictured elsewhere herein with Lophophora texensis below. 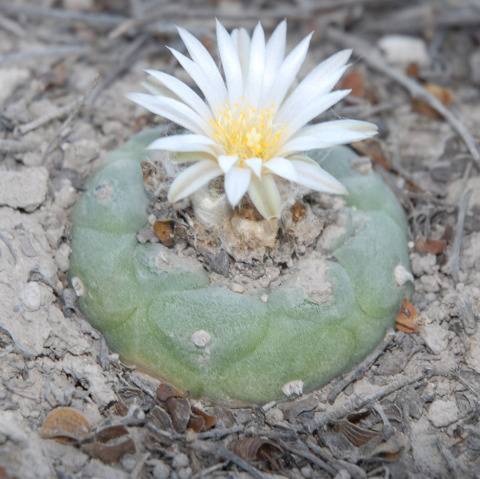 Bohata and coworkers 2005 have treated the genus Lophophora quite excellently and readers interested in detailed information about the Lophophora species (including many great habitat photographs) are directed to their special issue of Kaktusy. It seems obvious that most of the world’s experts now agree that five actual species presently exist, L. williamsii, L. koehresii, L. fricii, L. diffusa and the most recent species L. alberto-vojtechii. More may possibly be defined in Mexico in the future. The actual face of the genus is still being worked out and it seems likely that a number of varietal descriptions will find acceptance. There also may be another variety or form of L. williamsii, most often confusedly known as L. williamsii var. echinata sensu Weniger. It will be touched on in its own section but will be included with more detail and images in the discussion of L. williamsii. It is somewhat distinct from a typical L. williamsii in its form, environmental tolerances and chemical make-up. Whether this qualifies it as an actual species seems doubtful but my thought is that it certainly merits some sort of recognition. There is of course that pesky issue that, for plants at least, the concept of species is curiously defined with some nebulosity. Lacking a clear definition of what it takes to be regarded as an individual cactus species, let’s have a look at some of the names of interest. Parenthetical names (Kanji) may be found helpful in performing online searches for additional imagery. 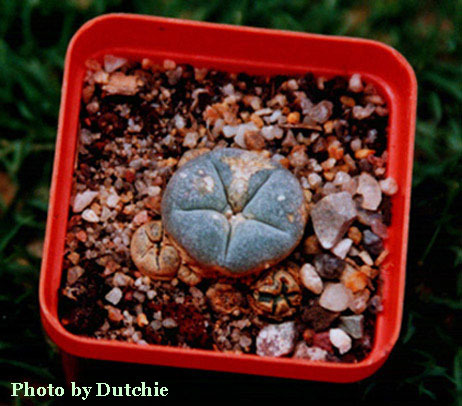 This miniature plant is the newest Lophophora species. Considering how recently it has been noticed, its range in Mexico has been found to be surprisingly large. I’m going to simply mention this species; Šnicer &/or Bohata can provide more details. It presently appears to lack any analysis. At some point this entry will be updated. My thanks to Ade for sharing the flowering images below! This is simply a growth form rather than a varity. This is also not one single plant line and it is not actually clear that all of them came from L. williamsii. Phytochemical analysis suggests they do not but comparative DNA work is still lacking. This is not a species but is simply a growth form that occurs in at least three of the Lophophora species. 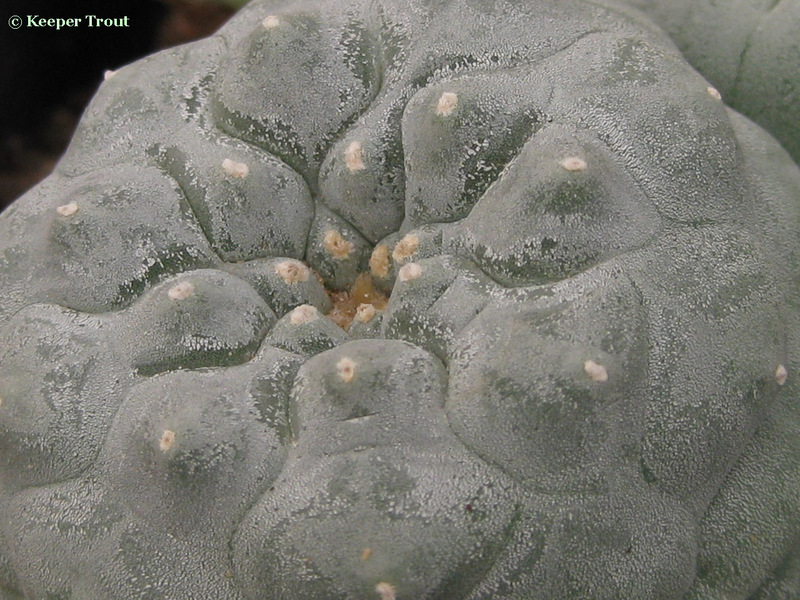 In modern horticulture, it is often specifically applied as a varietal name to a Lophophora fricii as var. decipiens. This is a confused name. Name is not presently accepted as it lacks any direct link to a wild population. 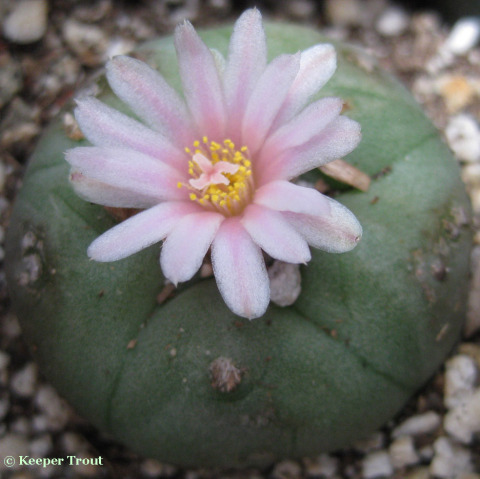 This is a pink flowered Lophophora fricii. 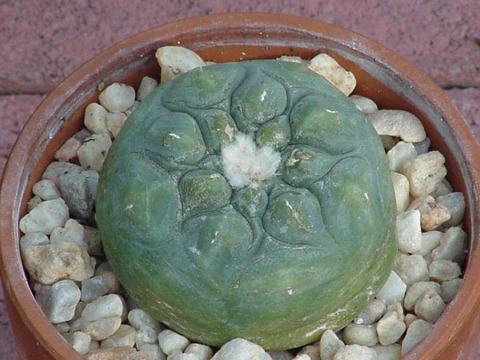 This is not a species but simply a growth form that occurs in all of the Lophophora species. It is not clear to what degree this form shows up in any given population with youngsters. 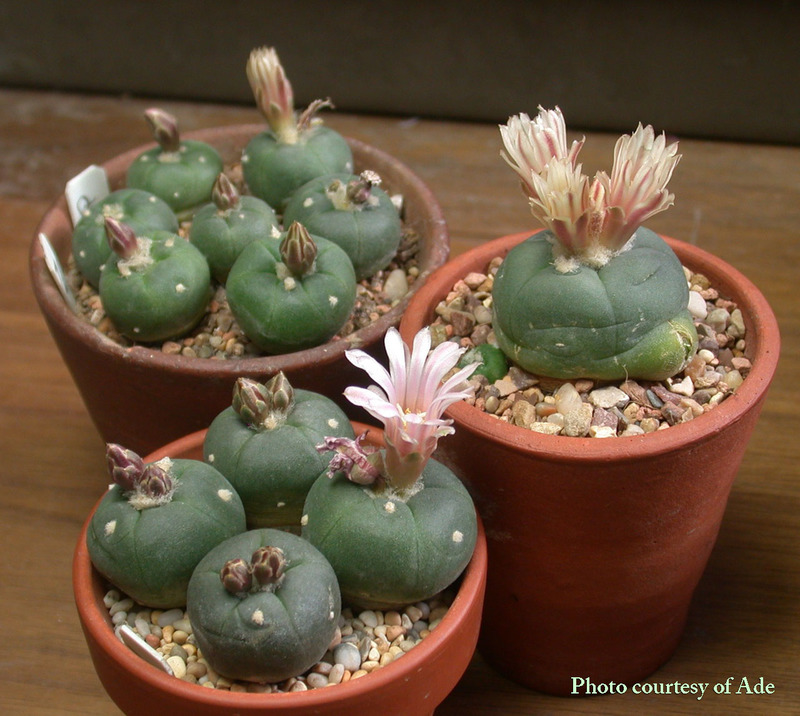 Plants and seeds sold domestically (inside of the US) under this name have often proven to be Lophophora diffusa (this is probably due to the illegality of L. williamsii in the US) but sometimes they are L. williamsii. 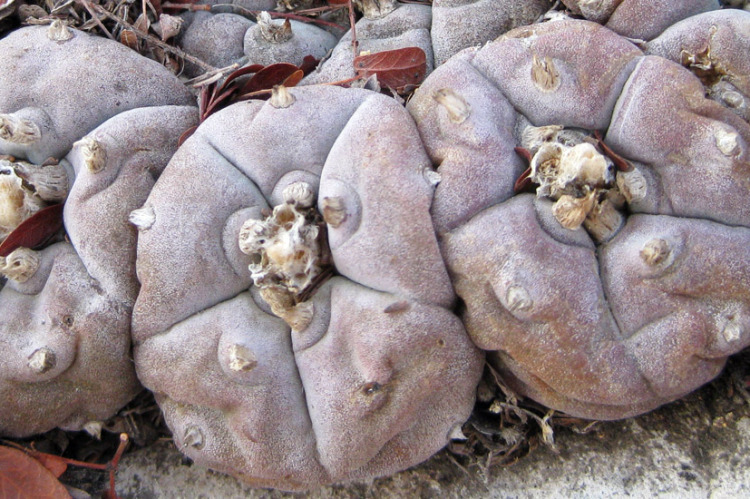 Lophophora williamsii “var. pentagona” above was grown from German “var. pentagona” seed; most of them do not stay like this for very long. Mescaline 0.709% (± 0.032) dry wt. Have some fun! See how many of the species for these “pentagona“s that you can identify without looking at the answers. This is another outdated name for L. williamsii that was published in 1869. 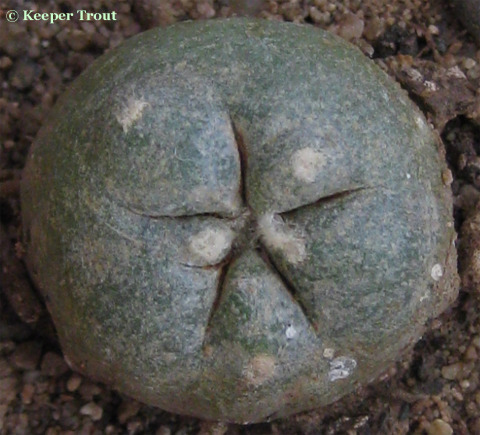 This is a synonym of Lophophora koehresii. 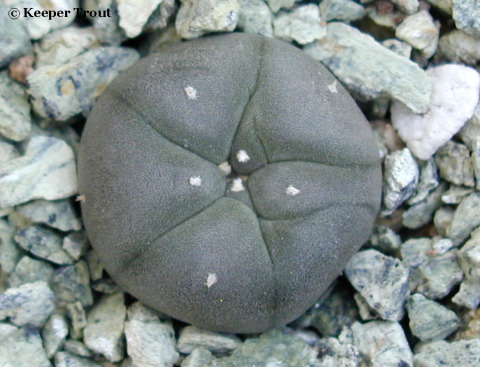 This is a synonym of Lophophora fricii. This is also not a real species despite seeds being commercially available. 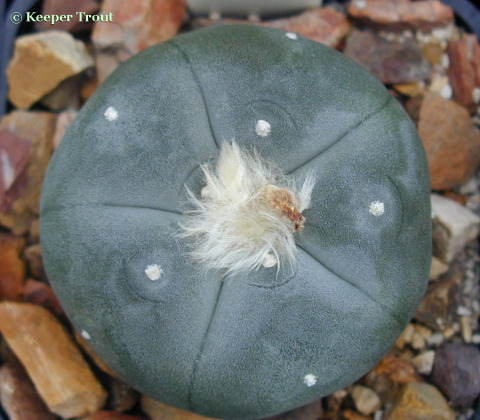 It is typically just Lophophora williamsii that came from from south Texas. 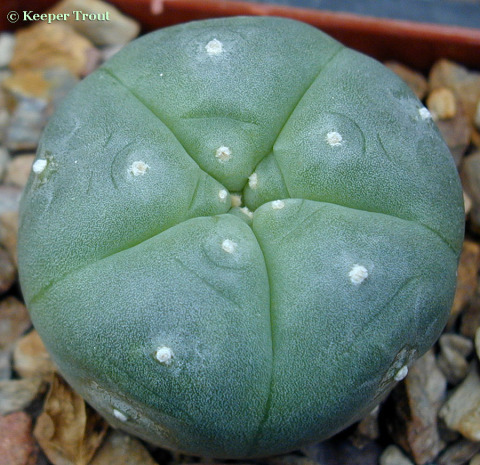 “Lophophora texensis” seedling that was grown from European seeds. 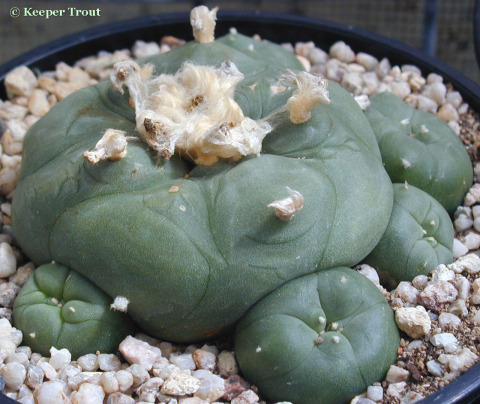 Lophophora texensis seedling that was grown from European seeds. 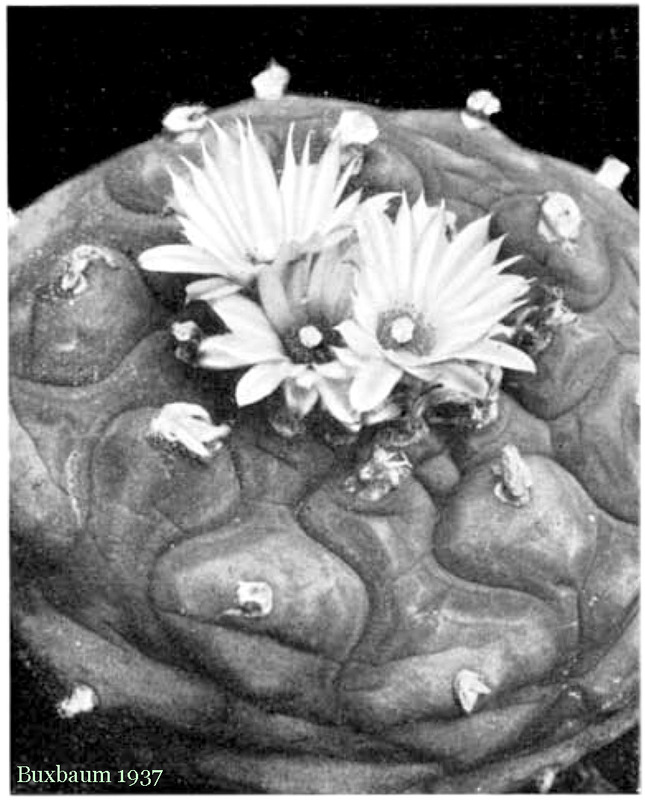 W. Taylor Marshall & Thor Methven Bock (1941) Cactacae, p. 138, comment that this “seems to be identical with” Lophophora Lewinii; giving its body color as yellowish-green with less pronounced tufts of wool and fewer & larger tubercles than on a L. Williamsii, and producing white to cream flowers. Obviously in their view L. lewinii is L. diffusa. 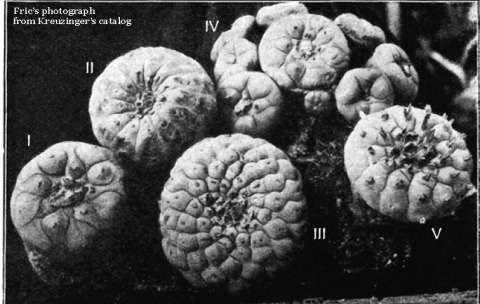 The photograph shown by Chavier is clearly Lophophora diffusa despite my photocopy being too poor in quality to permit reproduction here. This is a Lophophora fricii. This is apparently a new name for what was previously presented by Halda as L. diffusa ssp. viridescens and seems unlikely to ever gain any actual recognition as a species. More recently it was recognized as a synonym of Lophophora koehresii according to the International Plant Names Index (IPNI) online. This is yet another name in horticulture that is typically a synonym for L. diffusa. It seems to have come from Werdermann but I have not seen the original publication. Lophophora ziegleri also seems to fall into the “lutea” (i.e L. diffusa) category but this particular one in Oz clearly is not yellow in its body color. Franz Buxbaum 1937 (in his article “Der Formenkreis de Strombocactus“) includes a photograph (fig. 26) from Backeberg taken of Lophophora Ziegleriana that is clearly a Lophophora diffusa and in line with Pizzetti’s comments. This name apparently came from Soulaire. Buxbaum 1937: Figure 7, Photograph by Curt Backeberg. 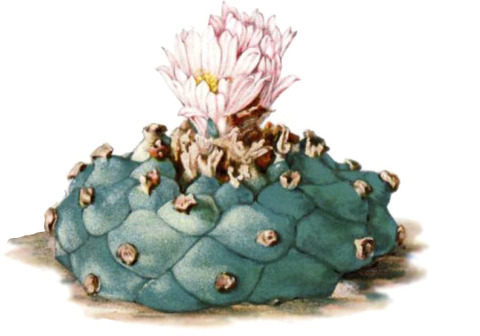 A common problem will soon encountered by anyone trying to sort out the different forms in horticulture: Horticultural designations of such peyote “species” and varieties are at the very least unreliably defined and may be unagreed upon between their many suppliers and growers. Eastern Europe and Japan in particular appear to be intensive centers of not just propagation but of extensive selection and breeding for unusual characteristics. A plethora of names accompanies the output from both sources. 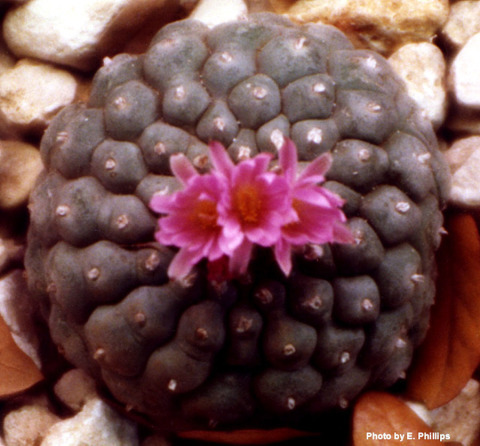 Koehres listed 25 additional L. williamsii populations that he had determined were self- fertile. L. williamsii Parras, Coahuila is said to be self fertile despite most people now placing this with L. fricii. Koehres did not get pollination for L. koehresii using pollen from L. williamsii Huizache but found L. williamsii Huizache could be successfully pollinated using pollen from L. koehresii. Koehres found that fruit can form from the early flowers within around 8 weeks but for the later blossoms the fruit often do not emerge until the following year. 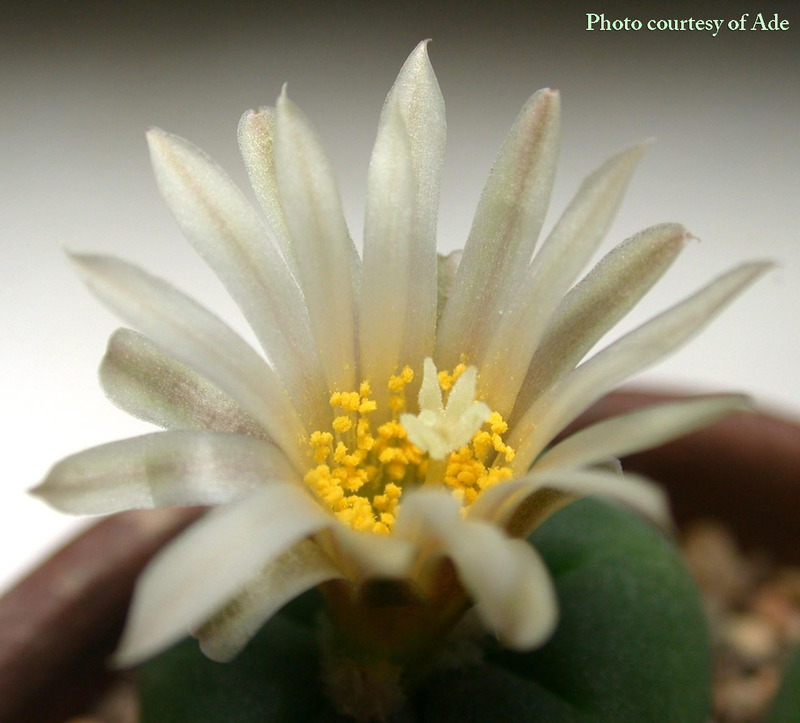 Koehres also commented that the self fertile populations are very uniform in comparison to the self sterile populations which are more highly variable in the shape of the body and the flower. There are a number of Lophophoras in horticulture that are known to be or suspected to be hybrids. 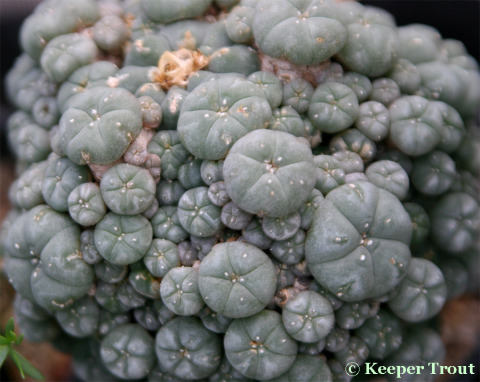 Most intriguing to me are Kada’s Lophophora diffusa X Obregonia denegrii. I look forward to hearing how those seedlings grow up. At some point an entry on this subject will be added here but the work is still ongoing so only this note is presently being included. Folk medicinal uses of peyote are many and varied. All species have apparently been employed for medicinal use on a local basis. Decoction is given for fevers, the root and/or plant chewed and used as a poultice for fractures, infections, large open wounds, snake-bite and scorpion stings. According to Landes 1963, the Potawatomis in Kansas believed it helpful for rheumatism and paralysis. 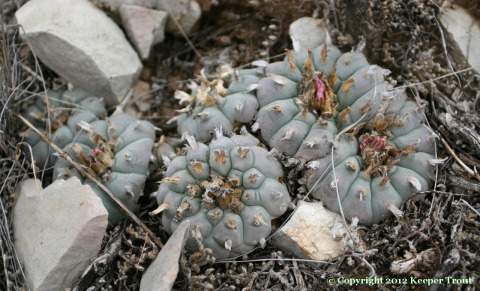 More traditional medicinal applications will be found listed within the entry for Lophophora williamsii.